You are curenlty in Devilbiss Health Pulmoneb® Compressor Nebulizer System 3-4/5" H X 7" W X 13" D, Weight: 5-2/7 Lb, Mmad: 5μ Or Less, Sound: 53 Dba, Maximum Air Pressure: 35&plus; Psig, Maximum Liter Flow: 8 Lpm, Electrical Requirements 115vac, 3 Prong Plug, Power C made by Devilbiss and asigned to category. The Devilbiss Pulmomate® Compressor Nebulizer System Keeps Pace With The World Of Managed Care By Providing An Unbeatable Combination Of Quality And Value. The Sleek Case Design Fits Easily Into Luggage, Backpacks And Diaper Bags For Easy Transport And Includes A Convenient Storage Compartment For Housing Tubing And Nebulizers. The Pulmomate® System Features An Updated Compressor Motor For Long-Term Durability And Performance. 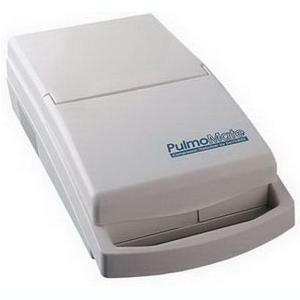 This System Delivers A Consistent And Optimal Pressure Flow To Any Nebulizer For The Most Effective Aerosol Treatment. Maximum Compressor Pressure 35 Psig Or Greater. Compressor Free Air Flow – 8 Lpm Or Greater. Large Built-In Compartment For Storing Nebulizers And Tubing. Consistent Performance Over The Life Of The Unit. You have selected Devilbiss Health Pulmoneb® Compressor Nebulizer System 3-4/5" H X 7" W X 13" D, Weight: 5-2/7 Lb, Mmad: 5μ Or Less, Sound: 53 Dba, Maximum Air Pressure: 35&plus; Psig, Maximum Liter Flow: 8 Lpm, Electrical Requirements 115vac, 3 Prong Plug, Power C from Aerosol Machines. We hope that this Devilbiss Health Pulmoneb® Compressor Nebulizer System 3-4/5" H X 7" W X 13" D, Weight: 5-2/7 Lb, Mmad: 5μ Or Less, Sound: 53 Dba, Maximum Air Pressure: 35&plus; Psig, Maximum Liter Flow: 8 Lpm, Electrical Requirements 115vac, 3 Prong Plug, Power C made by Devilbiss is what you were looking for. If you have any questions about this particular Devilbiss Health Pulmoneb® Compressor Nebulizer System 3-4/5" H X 7" W X 13" D, Weight: 5-2/7 Lb, Mmad: 5μ Or Less, Sound: 53 Dba, Maximum Air Pressure: 35&plus; Psig, Maximum Liter Flow: 8 Lpm, Electrical Requirements 115vac, 3 Prong Plug, Power C or any other products from Aerosol Machines, please call us. We have an experienced staff that will gladly help pick out the correct Devilbiss Health Pulmoneb® Compressor Nebulizer System 3-4/5" H X 7" W X 13" D, Weight: 5-2/7 Lb, Mmad: 5μ Or Less, Sound: 53 Dba, Maximum Air Pressure: 35&plus; Psig, Maximum Liter Flow: 8 Lpm, Electrical Requirements 115vac, 3 Prong Plug, Power C for you, also. If you are looking to make a purchase of Devilbiss Health Pulmoneb® Compressor Nebulizer System 3-4/5" H X 7" W X 13" D, Weight: 5-2/7 Lb, Mmad: 5μ Or Less, Sound: 53 Dba, Maximum Air Pressure: 35&plus; Psig, Maximum Liter Flow: 8 Lpm, Electrical Requirements 115vac, 3 Prong Plug, Power C in large quantity or you are a Hospital or Medical facility and need help on making a purchase of Devilbiss Health Pulmoneb® Compressor Nebulizer System 3-4/5" H X 7" W X 13" D, Weight: 5-2/7 Lb, Mmad: 5μ Or Less, Sound: 53 Dba, Maximum Air Pressure: 35&plus; Psig, Maximum Liter Flow: 8 Lpm, Electrical Requirements 115vac, 3 Prong Plug, Power C made by Devilbiss, please contact us.